The Violin Shop: Voller Brothers Violins. Copies, Fakes, or Frauds? 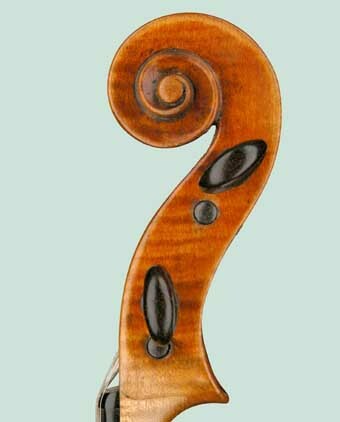 There have been a handful of copyists in violin making history that have given even the most experienced eye quite a jolt with their work... Jean Baptiste Vuillaume for one. But it is the infamous Voller Brothers who we'll take a closer look at in this article. It has been said that they were the best copyists in the world - so good, in fact, that they got away with forging Stradivarius' and other Italian instruments for many years. There were three Voller brothers - William, Charles, and Alfred. They were first employed by the London dealer George Hart and Son, starting about 1892. It is at Hart's shop that their talent for copying old Italian instruments became evident. The brothers were asked to make copies of the finest instruments that went through the shop, but, being an honest dealer, Hart made sure that the instruments were clearly labelled as such: Copies. Hart even had the brothers copy his own Del Gesu several times with outstanding results (Hart's Del Gesu is known as the 'Leduc'). After the brothers went out on their own (about 1900), however, their business took a shady turn. They began selling their exquisite copies to the unscrupulous dealer Vincent Cooper (he just sounds like a super villain), and Cooper began selling them as 100% genuine. The most famous case of this happening (and being recognized as a fake) is the 'Balfour Stradivarius'. 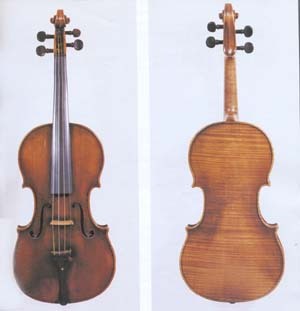 Cooper bought a 1692 Stradivarius copy from the Voller brothers for 45 British pounds. He then mounted a huge advertising campaign for the instrument, offering it as the real deal for 2,000 British pounds. Chanot and Chardon even wrote papers on the instrument, making it "legitimate". The instrument eventually sold privately for 2,500 British pounds! Luckily, the buyer found out it was a fake and they settled out of court. But buyers weren't always as lucky. In 1913, English violin expert Alfred Hill went to examine four supposed Stradivarius violins in Germany. Three of them turned out to be made by the Voller brothers. The Vollers soon realized how difficult it was to forge instruments by Stradivarius and Del Gesu because they were already well known and documented. So they began copying lesser known makers whose instruments were quickly increasing in value, particularly the works of Gagliano. The most unfathomable swindle, however, took place a few years after the last brother's death. Voller instruments were used to trick refugees escaping from Germany. As people fleeing the Nazi regime weren't allowed to take money out of the country, many would invest in objects. And what's easier to carry than a single violin? Vollers were sold as genuine Stradivarius instruments to refugees looking for a mobile asset to invest their money in, and many Voller brothers violins are in the United States today because of this. So. .... The Voller brothers were great copyists. There's a large number of players who would like exactly what they made- a violin the looks, feels and plays like a great Italian instrument but at a fraction of the cost. The Vollers sold their instruments mainly to dealers. They were happy to be paid well for their studied and detailed work. But did they cross a line, putting very nicely forged Italian makers' labels inside their instruments? The dealers who bought the instruments from the Vollers and re-sold the violins as "genuine" certainly engaged in fraud and deception. But is that the Vollers' fault? Of course, now, Voller brothers violins are considered quite good and valuable (in the range of $100,000 for a "genuine" Voller brothers violin. Ha! How do you know when a fake is a real fake???). This is reminiscent of a recent incident in the fine art world. Two forgeries of Monet paintings supposedly by Elmyr de Hory turned out to be forgeries of de Hory's paintings by Ken Talbot. Fakes of fakes! What do you think? If it plays, feels and looks like a Stradivarius, del Gesu, or Gagliano would you want to own it and play it? Or is playing on a great copy too fake? If you are interested and would like to learn more about the Voller Brothers, The Voller Brothers: Victorian Violin Makers by J. Dilworth, A. Fairfax and J. Milnes and The British Violin by T. Baker, J. Dilworth, and A. Fairfax are excellent resources. The Chanot-Chardon family that was linked about halfway up the page is interesting as well, a good resource on them is Parisian Violin Makers in the XIXth and XXth Centuries, Tome 1: The Family Chanot-Chardon by Sylvette Milliot, published by Les Amis de la Musique, 1994.